Dr. Mark McAllister at the University of Oxford's Department of Engineering Science said: "The measurement of the Draupner wave in 1995 was a seminal observation initiating many years of research into the physics of freak waves and shifting their standing from mere folklore to a credible real-world phenomenon. By recreating the Draupner wave in the lab we have moved one step closer to understanding the potential mechanisms of this phenomenon." Prof Ton van den Bremer at the University of Oxford said: "Not only does this laboratory observation shed light on how the famous Draupner wave may have occurred, it also highlights the nature and significance of wave breaking in crossing sea conditions. The latter of these two findings has broad implications, illustrating previously unobserved wave breaking behaviour, which differs significantly from current state-of-the-art understanding of ocean wave breaking." To the researchers' amazement, the wave they created bore an uncanny resemblance to "The Great Wave off Kanagawa' – also known as "The Great Wave' – a woodblock print published in the early 1800s by the Japanese artist Katsushika Hokusai. Hokusai's image depicts an enormous wave threatening three fishing boats and towers over Mount Fuji which appears in the background. Hokusai's wave is believed to depict a freak, or 'rogue," wave. Dr. Sam Draycott at the University of Edinburgh said: "The FloWave Ocean Energy Research Facility is a circular combined wave-current basin with wavemakers fitted around the entire circumference. This unique capability enables waves to be generated from any direction, which has allowed us to experimentally recreate the complex directional wave conditions we believe to be associated with the Draupner wave event." The research was led by Dr. Mark McAllister and Prof Ton van den Bremer at the University of Oxford, in collaboration with Dr. Sam Draycott at the University of Edinburgh. This project builds upon work previously carried out at the University of Oxford by Professors Thomas Adcock and Paul Taylor. 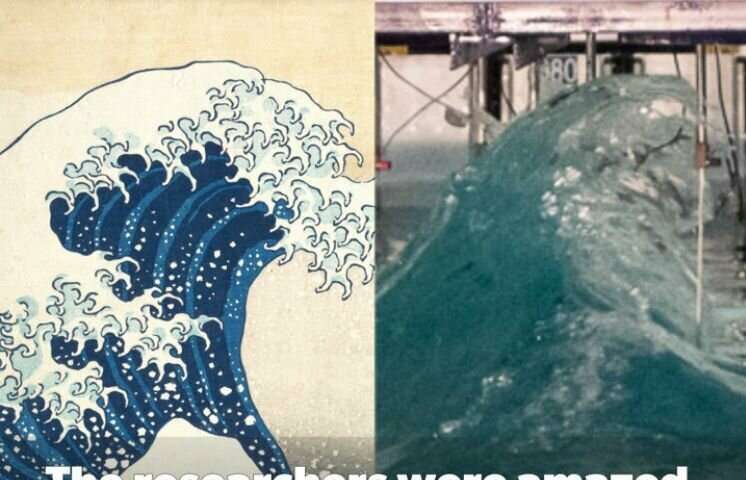 Although interesting I do not think that Hokusai had any way of knowing exactly how this particular freak wave looked like as photography was not yet invented and I doubt that there was somebody present to draw a sketch of the wave. I would therefore attribute the similarity to pure coincidence.